Lisfinny Castle, or tower house (to give the proper terminology), stands on a south facing slope overlooking the Bride and the town of Tallow beyond at the western edge of County Waterford. The castle is a rectangular tower house with four floors. A barrel-vaulted loft is over the ground floor and a vault over the second floor. The first and second floors are lighted with rectangular windows while the third floor had wider windows with dressed surrounds. The name Lisfinny means Fineen’s Liss or Fort in Irish and is situated on the ridge called Druimfineen which extends from Helvick Head to Castlelyons in County Cork. Lisfinny was named for Fingin Mac Luchta, who was king of Munster around AD 190. The Normans came in 1169 and within a few years had captured most, if not all of present County Waterford. To secure their new found they built castles at strategic places. These first castles were of timber construction raised on a mount of earth and surrounded by a timber fence. We called this type of castle, a motte and bailey as in this drawing. A good example of this construction is the small hill called Gallow’s Hill outside Dungarvan. The Round Hill just east of Lismore possibly had a timber castle upon it but archaeological investigations have yet to be conducted to determine if this was so. The next development of castles occurred when Prince John came to Ireland in 1185. He had stone castles built at Lismore, Ardfinnan and Tibberaghny. These castles had a round keep surrounded by a stone wall. The present Lismore castle is largely a construction of the nineteenth century. The land upon which Lisfinny was built was part of the honour of Dungarvan in the mid thirteenth century and the property of Thomas FitzAnthony. It came to the Fitzgerald family after John Fitzthomas Fitzgerald (died 1261) married Margaret, one of the daughters of Thomas FitzAnthony. The descendants of John Fitzthomas Fitzgerald held the manor of Lisfinny until the 1580s. In 1520, the 8th Earl of Desmond gave to his fifth son, Gerard Oge a lease of the manor of Lisfinny, which included the town of Tallow and its surrounding townlands. Gerard subsequently leased this property to his fourth son, John Fitzgerald, along with Strancally castle. When John died in 1550, his twelve year old son Thomas should have inherited the property. Instead the Earl of Desmond seized both manors to avoid the Dublin government acquiring them under the rules of wardship. Young Thomas was imprisoned where he died in 1554. The Earl gave both manors to his brother Sir John Fitzgerald of Desmond. Sir John also had a lease of Mogeely castle. We have no exact date for when the present tower house was built. Similarly we do not know how much it cost or how long the construction period lasted. The new castle of Kirby Muxloe in England was built for Lord Hastings in 1480. It took four years and one month to build. A recent experiment was conducted into tower house security. The main point of access into a tower house is the doorway. A team of eight used a battering ram at a rate of twenty hits per minute and knocked the door flat in 54 hits or five minutes work. A fire experiment on the door took 40 minutes to burn the door. Most doorways are on the ground floor. It is only in the extreme south-west of Ireland that you find tower houses with a first floor doorway. We have little record of life in Lisfinny tower house but a French visitor to Ireland in 1644 described the tower houses in these words = “the castles or houses of the nobility consist of four walls extremely high, thatched with straw; they are nothing but square towers without windows, or at least having such small openings as to give no more light than a prison. They have little furniture, and cover their rooms with rushes”. Following the battle of Affane a great number of people across County Waterford and elsewhere received pardons for their involvement. In May 1567 Peter liagh Poer of Lisfinny, horseman and Richard fitzedmund Poer of Strancally got a pardon. We often think of West Waterford as an exclusive Fitzgerald area but a number of people called Power lived there. In 1572 the properties of Sir John of Desmond were listed as the castles, manors and towns of Kilmanahan, Lisfinny, Mogeely, Carrignavar, Philipstown, Agh Crossen, Broghill and Kilcolman. Living at Lisfinny in 1572 were a number of gentlemen and soldiers of the Sheedy family. These were Rory (alias Ferdoragh) McSheedy, and his two sons; Manes McSheedy and Edmund McSheedy, all gents. Also at Lisfinny was Donill McShane McConemarre, a galloglass. These people received a pardon along with Eustace FitzThomas Roche of Rosgrelle on February 15, 1572. At the same time as the above, James FitzJohn Fitzgerald was living at Strancally. He got a pardon on September 30, 1572 along with his cousins Maurice Fitzgerald of Sheanmore and Maurice FitzJames Fitzgerald of Mocollop. On October 1st, John Fitzgerald of Desmond, lord of Lisfinny received a pardon. On that same day the Earl of Desmond, Gerald Fitzgerald also got his pardon. Late in 1573 Sir John of Desmond, with Donnchadh Mac Brien, conducted four lightening strikes upon the Earl of Ormond’s property in Counties Tipperary and Waterford. The purpose of these attacks was to feed the rebel armies and deny the English an available food supply. At the County Waterford castle of Derrinlaur, Sir John took 180 cows. While Sir John stayed in the Tipperary/Kilkenny area, 40 of the cows were taken back to Lisfinny and killed there. Following the first Desmond rebellion (1569-1573) many of those who took part received pardons including Thomas Oge Mac Thomas Mac Rory McGrath of Lisfinny in November 1576. This man was the seneschal or chief steward for Sir John of Desmond in the manor. Other members of the McGrath family held similar positions in neighboring manors like Mocollop. In late 1575 Sir Henry Sidney, Lord Deputy of Ireland, conducted a tour of Munster by way of Waterford and Dungarvan and onto Cork via Lismore and Lisfinny. At the later place, he called upon Sir John of Desmond, the owner and judged him to be a “good and loyal subject”. Within a few years this opinion would be radically changed as Sir John became one of the principle rebel leaders in the second Desmond Rebellion. For the moment John Fitzgerald received the by now usual pardon for rebellious activity. On May 5, 1576 he got this along with Gerald Fitzgerald (alias McRodery) and Johnn oge McGrath of Lisfinny. Manus McSheedy had by this time moved from Lisfinny to Mogeely. In the wider area of Lisfinny manor, Thomas McShane McEdmund of Curraghreagh also got a pardon with the others. Beyond the manor of Lisfinny a number of attainers and supporters of Sir John of Desmond also got pardons on May 5th, 1576. These people lived in many parts of Counties Cork and Waterford including a number of local people. John McTibbot Roche of Kilbeg and Donal McDavid Eleighane, of same, both husbandmen; David McEdmond Roche of Kilwatermoy (A kern), Donal McMaurice McGrath of Kilcha and William FitzJames Roche of Kanmock, both horsemen; Peter Power of Tullogh, yeoman; David YKeely of Templevalley, John McDavid YKeely and Maurice McDavid YKeely of same, husbandmen; Donal McDiermod boy of Knocknamuck, Thady McYLeyne of Ballymakernagh, and William McShane YLeghan of Kilwatermoy, all husbandmen. Later in November 1576 Thomas oge McThomas McRory McGrath of Lisfinny received a pardon along with a whole host of people across Counties Cork and Waterford. The other person from Waterford in this pardon was Thomas McEdmond Power of Monatrim. In 1579, Gerald, fifteenth Earl of Desmond, made an attack on Youghal as the opening action in his final rebellion. Following five days of pillaging within the town, the amassed treasure was taken to Strancally and Lisfinny castles, which were at that time garrisoned by Spanish soldiers. Shortly after, the Dublin government wrote to London that they didn’t believe they could take Lisfinny Castle without cannon, such was the strength of its garrison and masonry. During the Desmond rebellion of 1579-83, the Earl of Ormond adopted a “scorched earth” policy in the winter of 1579-80. After passing through County Limerick, Ormond proceeded to Coshmore/Coshbride in December 1579 where he burnt the lands of Sir John of Desmond at Lisfinny. By May 1580 a force led by Lord Power, Sir Thomas of Desmond and the sheriff of County Waterford camped near the woods of Lisfinny to stop the rebels coming into County Cork via The Vee road from Clogheen. During his life, Sir John didn’t care too much for personal property but his English adversaries did. 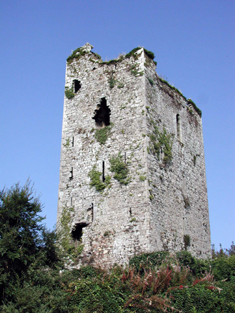 John’s great castle at Mallow eventually passed to Captain Thomas Norris (who hoped, unsuccessfully, to get Lisfinny and Mogeely), Edmund Spenser, the poet, got Kilcolman castle while Sir Walter Raleigh got the castle and manor of Lisfinny. The government had given a three year lease on Lisfinny manor, along with the manors of Mogeely, Strancally and Shane, to Richard Shee and Robert Rothe of Kilkenny in March 1584. The grant mentions the lands of Twileig, Aglish, Knocknamuck, Barnenebolegy, Curragh Reagh, Ballingarran and Kilbeg as part of Lisfinny. The manor of Strancally which was previously held with Lisfinny was in 1584 the property of James fitz John Fitzgerald, who was by then deceased. In the Rothe/Shee grant these lands included Strancally, Kilnaganagh, Kanemucky, Kilmacnicholas and Monetrown. The original plantation of Munster had planned for four classes of seignory; viz: 12,000 acres, 8,000, 6,000 and 4,000. The planter with 12,000 acres was to have a demesne farm of 2,100 acres; six farmers with 400 acres each; six freeholders with 300 acres each and 42 copy-holders with 100 acres each. The remaining 1,500 acres was to be apportioned in smaller tenures on which at least 36 families must be settled. There were originally to be three big planters of 12,000 acres in this region, namely: Sir Walter Raleigh, Sir John Stowell and Sir John Clifton were to get the lands on the west bank of the Blackwater. They were to populate their new estates with people from Devon, Somerset and Dorset. But early in 1587 Stowell and Clifton sold their interests to Raleigh or were pressurized to do so. The result was that instead of Raleigh getting 12,000 acres he ended up getting 42,000 acres which made him the biggest planter in Munster. 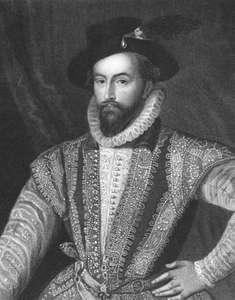 In March 1587 the manor of Lisfinny, as part of 42,000 acre estate along the Blackwater and Bride Rivers, was granted to Sir Walter Raleigh. Raleigh got full ownership in fee farm with only a rent to the crown of one hundred marks sterling. In 1589 Raleigh gave a lease of Lisfinny to his chief local agent, Andrew Colthurst. In the summer of 1599, during the Nine Years War, the Earl of Essex conducted a long march through Munster. The army entered the Bride valley from the west by way of Fermoy and Castlelyons. Their objective was to take Conna Castle, home of one of the chief rebels. On 16 June the army reached Conna but found the castle burnt and abandoned by the rebels. Essex established a camp between Conna and Mogeely Castle to rest the night. The following day was Sunday and Essex used the rest day to await further reinforcements. During Sunday night, Essex got four hundred troops into the bawn and outhouses of Lisfinny Castle. This was a very benefitual move as a large rebel force shadowed Essex’s army while it marched to Affane to cross the Blackwater. The rebels threatened to attack near Lisfinny but with the castle in English hands, their escape route as closed and they didn’t wish to get boxed in. Essex successfully crossed the Blackwater and proceeded on to Dungarvan and Waterford while subduing the countryside along the way. In the following year of 1600, Henry Pyne (who leased Mogeely from Raleigh) petitioned the government to put garrisons in many of the castles on the Bride including Kilmacow and Lisfinny. Pyne’s own castle already had fifty troops from the Lord President of Munster. The government directed the Munster President to examine the situation and make his own judgement on the merits of places garrisons in the said castles. In May 1601 a great number of pardons were given out to people who took part in the Nine Years War. A few local people got such pardons like Donagh McTeige of Lisfinny, husbandman, along with William Brown of Lisfinny, yeoman and Dermod O Dolan, a labourer of same. These were joined by James fitz William Roche and Morish McConogher boy of Kilwatermoy, (both yeomen) along with Philip McDonnell I Donortie of Mocollop, yeoman. In 1602, Sir Richard Boyle purchased Sir Walter Raleigh’s Irish estates including Lisfinny. The manor at that time covered six ploughlands and included the townlands of Aghanbrogue (Ahaunboy), Ballygarran, Croghrew (Curragh Reagh), Kilcalf, Kilmore, Kilowen (Coolowen) and Knocknamuck along with Tallow town. 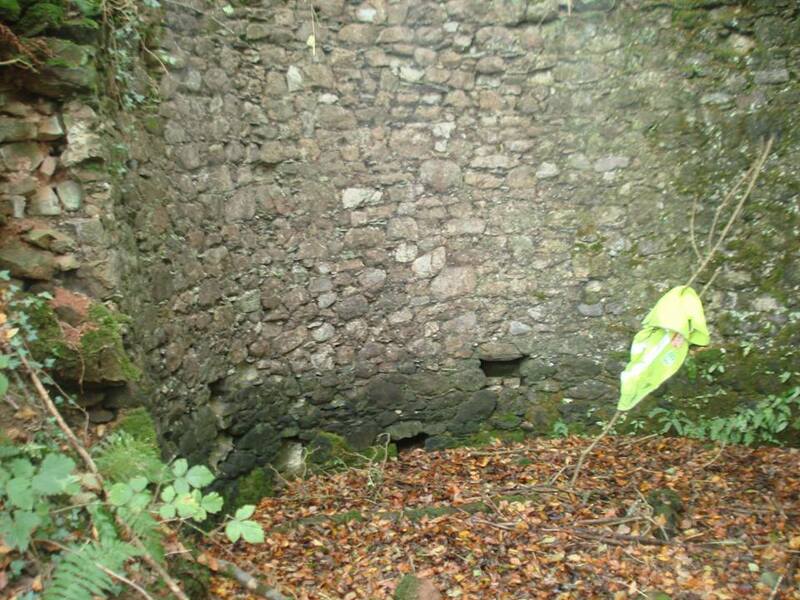 At an inquest the following year, the manor was measured at five and a half ploughlands but included a salmon weir on the Bride and the townland of Aglish. By the time of the Civil Survey in 1654, Lisfinny had declined so much that it failed to get a mention. Instead we are told of the ruined castle in the townland of Knocknamuck which was the former stronghold of the Desmond Fitzgeralds. The manor of Lisfinny had been so developed over the past fifty years that it now measured seven and a half ploughlands. Over the centuries the castle was left as a ruin while a new Georgian house was built beside it. However, in 1888, the castle once again fulfilled one of its original functions. Douglas Pyne, the lessee of Lisfinny, for M.P. for the consistency of West Waterford and choose to support the tenants in the Land War. The authorities didn’t like his actions of support and attempted to arrest him under the Coercion Acts. But Pyne was one step ahead of the government and before they could arrest him, he had barricaded himself into the castle. Here he had a big store of provisions to see out a long siege. The police erected tents in the garden and settled down for the long wait. Pyne observed how relaxed they were and took advantage of this by escaping early one foggy morning. Before the police knew what had happened Pyne was long gone. Sometime later, whilst returning from England, Pyne fell, or was pushed, overboard from the Cork steamer and was drown. In all this history, and the history unrecorded, Lisfinny tower house still stands as a monument to all the preceding and a credit to the builders who erected it some 500 years ago. The ringfort in the townland of Moydilliga, also spelt as Modeligo, is situated in the Barony of Condons and Clangibbon in County Cork and in the civil parish of Knockmourne. 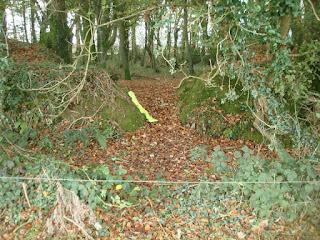 The ringfort lies on the north side of the public road on a bend in the road. 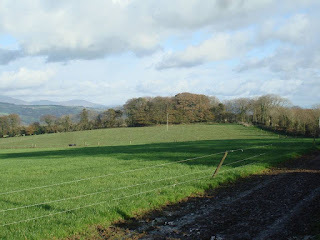 Yet of more interest is that the road is ancient ridgeway track route which can be traced from Tallow Hill in the east as far as Kilbarry townland in the west. Moydilliga ringfort stands at height level 348 feet. From the ringfort the valley of the Blackwater can be seen down the northern slope while the Bride river valley can be seen down the south facing slope. It is this meeting of the four main points on the compass which contributed to the location of the ringfort in its present site. 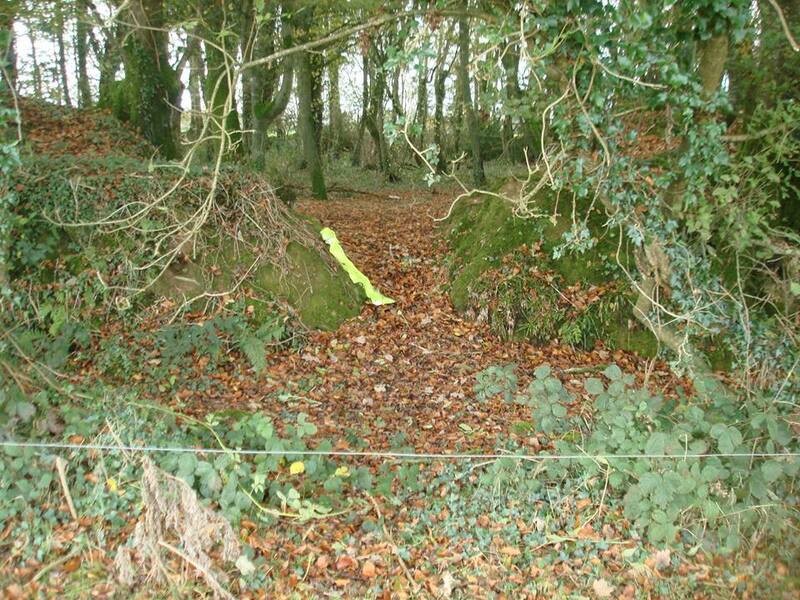 The term ringfort is a bit of a misnomer as possibly most ringforts were just fortified farm steads. An interestingly hill in Ballydorgan townland, to the west of Moydilliga ringfort (at 582 feet) is called Cnoc na Macra or Hill of the Elite. 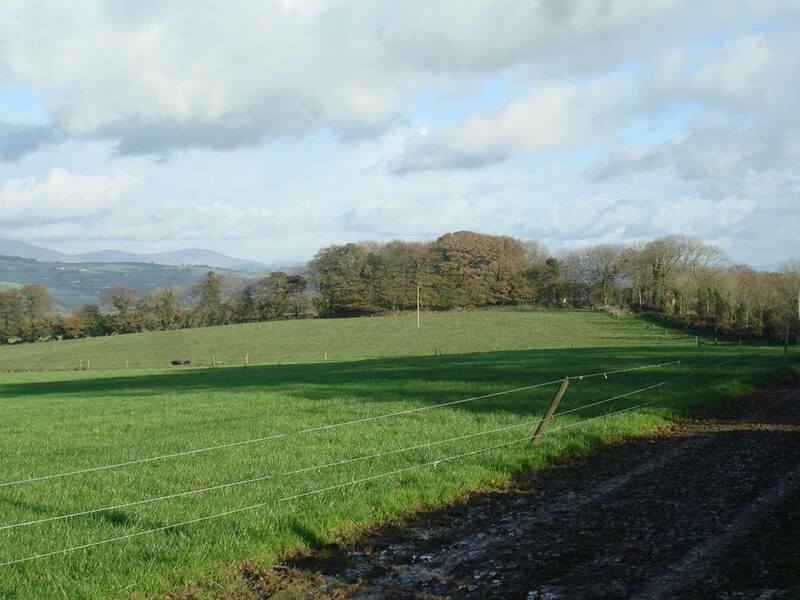 The entry in the Archaeological Inventory of County Cork says of Moydilliga ringfort that it lies in pasture on gentle north facing slope and is roughly circular in area (c. 50 meters E-W). The ringfort is enclosed by an earthen bank (internal height 1.6 meters; external height 1.7 meters) with an external fosse that is about 1.2 meters in depth. The law tracts give 1.83 meters as the bank height of a royal ringfort but there is no tradition of Moydilliga being a royal site. 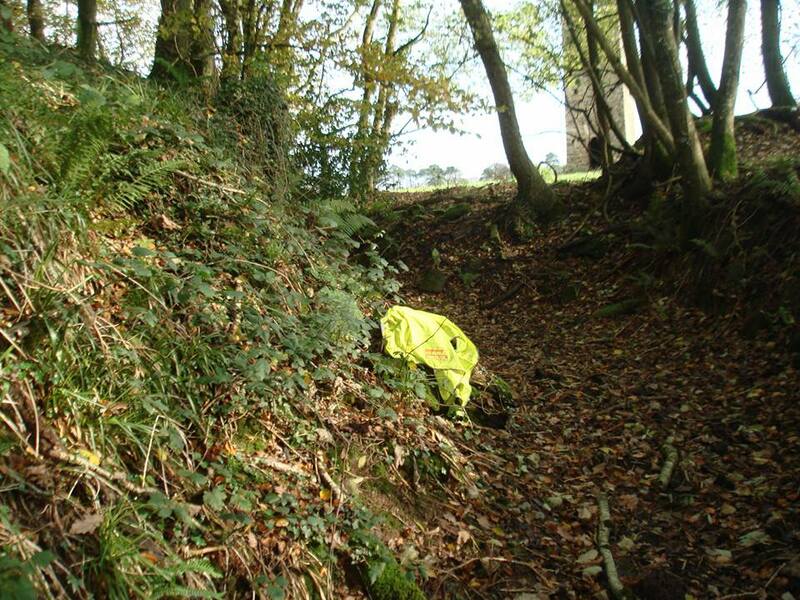 There is a break in the bank to north (width 4 meters) with a causewayed entrance to east (width 4.2 meters). Most ringforts had an east facing entrance. The interior slopes down gently to north and is heavily overgrown with trees. There is evidence for quarrying in north-northwest quadrant. On the outer edge of that NW quadrant somebody has built an almost circular stone structure into the bank of the ringfort, possibly as an early grass silage silo. In the absence of an archaeological work on the site it is difficult to know what Moydilliga ringfort looked like in its day, about 1500 years ago. It possibly had a timber palisade fence on top of the bank and a fortified gatehouse. Inside the ringfort there were possibly a number of circular timber houses for people located near the centre and animal pens around. Yet a few excavated ringforts have displaced no domestic function and were just cattle enclosures or sites of industrial use. 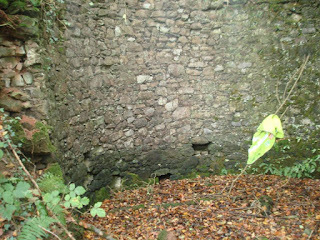 About 20 meters to the east of the ringfort is a tall square roofless tower. The tower dates to the late nineteenth century and was depicted on the 1905 Ordinance Survey map as adjacent to a now vanished avenue to Modeligo House. The tower measures 2.9 meters east-west and 2.9 meters north-south and is about 8 meters in height. Inside the tower are socket-holes for a wooden stairs no long gone. 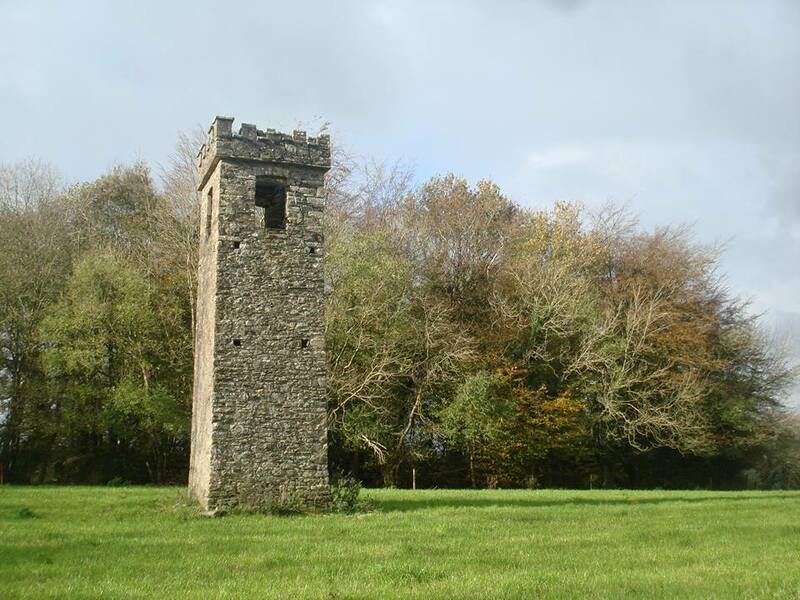 An article in the Cork Examiner of 18th December 1931 said that the tower was built by Mr. Braddell (the local landlord) so he could watch the hunt in his old age. On the east side of the now vanished avenue heading north to Modeligo House was a now levelled enclosure. This was depicted on the 1905 and 1935 Ordinance Survey maps as a diamond shaped enclosure (c. 40 meters north-south and c. 40 meters east-west) planted with trees. The age of this levelled enclosure is unknown. It was levelled in the 1980s during land reclamation. The avenue was not depicted on the 1840 Ordinance Survey map. About 80 meters to the south east of the levelled enclosure was a circular enclosure which was also levelled in the 1980s during land reclamation. The enclosure was depicted on the 1905 and 1935 Ordinance Survey maps of about 38 meters in diameter. 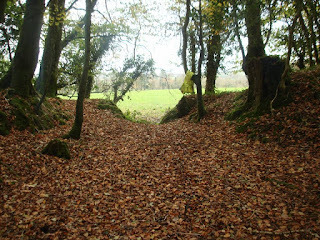 About 1300 meters to the north-east of Moydilliga ringfort, is an interesting ringfort that was deliberately bisected by a public road sometime before 1840. People in the past normally avoided ringforts and stayed away from harming them as the home of the fairies. Clearly somebody before 1840 had no such inhibitions. The Moydilliga ringfort and the surrounding ringforts are part of the most numerous archaeological monument type in the country. Most ringforts date to the Early Christian period (500-1000 AD) and the vast majority are single bank forts termed univallate like at Moydilliga.